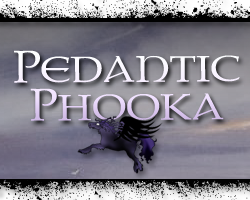 Please welcome Holly of Pedantic Phooka Book Reviews to Alison Can Read. She's only been blogging since June, but she already has a gorgeous, well-organized blog. Definitely check it out! A year ago this month, I took a girls weekend trip to Forks, Washington with my best friend. We had so much fun! If you are a fan of The Twilight Saga, I highly recommend taking the trip once before the Twilight sparkle fades in this little town. The vacation began with a flight into Seattle and a ferry right across the Puget Sound to the Olympic Peninsula. We were on our way to Port Angeles, the setting for several key events in the series. We didn't waste any time heading to East First Street where most of the action occurred. Our first stop was the famous Twilight visitors map, located in the Dazzled by Twilight store in Port Angeles. Visitors are asked to place a pin the map to represent their home towns, and there are literally thousands of pins in the map. Directly across from the store is the movie theater from New Moon. Although they weren't showing any Twilight movies while we were there, they do feature the entire series every time a new movie is released. 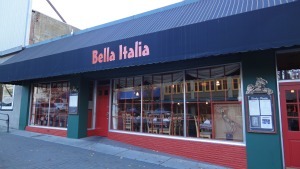 The next stop was Bella Italia, the location for Bella and Edward's first unofficial date in Twilight after he saves her from being attacked. Of course, Edward did not eat anything during the date, but Bella had the Mushroom Ravioli - which is now named after her on the restaurant's menu. I had Bella's Mushroom Ravioli for dinner and it was delicious. After dinner we made the hour drive into Forks. The road between the two towns is a series of crazy twisting turns with no streetlights. It is a tough drive to make in the dark. Kind of adds a new dynamic to Edward's insanely fast drive home after dinner, doesn't it? No wonder Bella was terrified. We stayed the weekend at the Miller Tree Inn Bed and Breakfast, otherwise known as The Cullen House. 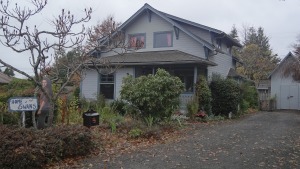 It was built in 1916 and is currently run by Bill and Susan Brager when the Cullens are out of town. I highly recommend staying at the Miller Tree Inn; the experience and service was outstanding. There is some interesting vegetation on the Cullen property. One tree in particular is called a Monkey Puzzle Tree and is most commonly found in Chile. Because of the species age, it is described as a living fossil. Word in town is that the tree was brought to the property by the Cullens themselves. On day 2 of our Twilight vacation, we took the Twilight bus tour out of Lepell's Flowers and Gifts. Lepell's has been part of the local culture in Forks for over 50 years - long before the Twilight phenomenon came to town. Charlene Cross, the owner of Lapell's, is featured in the "Twilight in Forks" documentary, in which she reveals some of the town's history. Charlene was very nice, and so was our tour guide Randy! First stop on the bus tour was the Forks City Hall and Police Department. They have a Charlie Swan badge and uniform on display for pictures, as well as the Sherrif's police car. There wasn't much going on at the police station while we were there, so Charlie must have been a little bored. 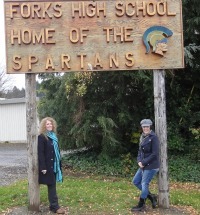 Next stop was Forks High School, which was a bit of a disappointment. The school was demolished earlier in 2010 because the building was in such bad condition. However, the town does plan to save the fascia of the building and use the area as a park one day. We did still get to see the "Home of the Spartans" sign that was featured in the movies. Moving on to the Forks Visitor's Center, we were able to see both of Bella's trucks. The book featured a Chevy truck from the 50's, but the movie featured a Chevy truck from the 60's. They are both available for pictures. The inside of the visitor's center is filled with life sized character cutouts from the movie. We laughed our butts off posing with all the fake vampires. It was really interesting to hear that Forks has gone from 200 annual visitors more than 18,000 annual visitors since the Twilight books were published. From here we moved on to the Forks Community Hospital where Dr. Cullen works. Fans are not allowed into the hospital, but we were allowed to stop by Dr. Cullen's reserved parking space and check out his medical jacket. After a short stop at the Swan house, we started heading toward LaPush. The Vampire-Wolf Pack treaty line is well marked along the way. Jacob Black's house is available for vacation rentals, and comes complete with Jacob's motorcycle. 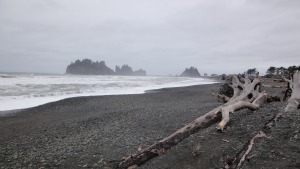 Our favorite part of the vacation was our time at First Beach in LaPush. It was absolutely beautiful. We both agreed that we could have spent a week at the beach alone. Some of the trees on the beach were a fiery reddish color that made them look like they were covered in blood. It is actually just a reaction from the wood and salt water that will fade over time, but it was a unique site that I've never seen anywhere before or since. Do you remember the island that was in the background of the beach scenes? It's called James Island (Quileute: A-ka-lat, which means top of the rock). It was reportedly named after a Quileute chief. It was used as a burial site for tribal chiefs and is considered sacred ground. We did see wolf tracks around the beach area, but no sign of actual wolves. The rest of our trip was spent sight-seeing on our own. There are plenty of places in town to shop for souvenirs, including the mother-ship Dazzled by Twilight store. There are Twilight themed food selections on menus everywhere in the area, which is fun. My final recommendation is to visit the Hoh rainforest on your way back to Port Angeles. The area is unbelievably beautiful and filled with wildlife. Whether you are a hunter like the Cullens, or just a Twilight fan like us, there is plenty to do and see. I don't necessarily feel like I need to make another trip to Forks, but I'm I definitely glad I did it once. I do plan to take a full week's vacation to First Beach one day. If you intend to visit the area, keep in mind that the locations look exactly like Stephenie Meyer described them in the books. The movies were not actually filmed in Forks, with the exception of some scenery shots from the town and the beach. If you are interested in visiting the locations from the movie, that would require a trip to Oregon rather than Washington - but you could probably hit them all in a long weekend if you really wanted to. Personally, I wanted to be true to the books, and it was a fantastic experience. Go, and have a great time! Sounds like you had a wonderful time. I'd love to go visit, but i'm all the way in the U.K- by the time i could afford to the Twilight buzz would have calmed down! Lol. i was in oregon for victoria's wedding two decembers ago. it was soooo enchanting. all the woods and the trees... gorgeous. i could live in oregon. i didn't go to forks. i did go to the viewpoint inn where the prom scene was filmed. no one was there ... and it was neat to walk around. I'm so happy that you had fun there, Alison! And I can't wait until I can watch the Breaking Dawn movie -- so pumped! 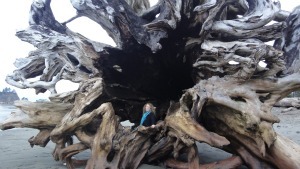 Wow, how cool is that tree on the beach! I bet it's gorgeous there, I would love a chance to visit. I can't even imagine what Twilight has done for the tourism in that tiny town:) Thanks for sharing your trip and your pictures Holly! This reminds me of my trip a few years ago. I went with the friends I met on the Twilight Lexicon. We had a ton of fun exploring the little town. And, it's so gorgeous there! I'd love to live there just because of how gorgeous it is. I'm glad you had a great time! Thanks for the walk down memory lane. Sounds like you had a nice time. I want to go there now. I'm so jealous. It sounds like you have an amazing time. I would love to take this trip with my besties. I love that this series has gone beyond books and movies to affect an entire town. WOW! Amazing pictures! I would like to visit there myself one day! Wow, that sounds like an amazing trip! Makes me want to go check it out while the hype is still going strong...probably won't get a chance though. Thanks for sharing your adventure and the pictures - very awesome! The trip looks and sounds like it was so much fun! I'd love to go back to Washington someday - we used to live in Bremerton when I was very young, so we went to Seattle a lot, and I think we'd been to Port Angeles before, but never to Forks. Sounds great. I sooo want to go now!